If you are going to get serious about living an nomadic lifestyle, there are going to be some resources you can’t live without. I’m going to break it down for you below so it’s easy to follow along and can be used as a checklist. We cover an assortment of topics and categories that have been researched over the years for our own adventure. Rather than letting all that great research data go to waste, we decided to open some of it up to the public, in hopes that it could help others get prepared for the nomadic life early or allow them to identify with alternative solutions to an existing nomadic lifestyle they already chose. There are a lot of variables to the nomadic lifestyle that many people don’t think to consider. 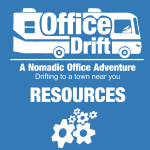 It’s our hopes that the resources we provide on OfficeDrift™ will help someone on their journey. Click a resource link below to learn more. I hope that all the information we provided above is helpful in your research for your own journey. The nomadic lifestyle is not for everyone, however, it is beneficial being able to work from anywhere in the world as long as you have an internet connection and a hotel room or office on wheels with you. Share a link to our resources with others you think would find them helpful. I look forward to seeing you out there someday. Enjoy your journey and safe travels.